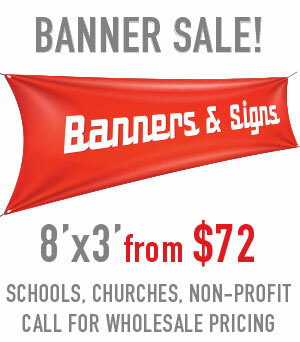 Banners are the perfect way to get your name out there - in a BIG way! Whether you're advertising your business or promoting your next event, custom vinyl banners are an effective way to get your customers' attention. With several types of materials for both indoor and outdoor applications, you can print your message in full color to spread the word about your company, wherever you can! Need a banner for your next event? From trade show displays to construction sites, school registrations to outdoor sporting events, printing a banner to showcase a product or your home team is easier than ever. Printing banners for local events such as church fundraisers, blood drives, youth camps and concerts is critical for informing the community of your cause, and/or directing traffic during your event. And it doesn't end with just outdoor banners - remember your indoor event displays! Optimize your customer's experience with colorful pop banners, curved displays, or retractable banners for easy set up and portability. If you need a sign for your business, school or other organization? Tower Media Group in Mesa AZ can help you design and produce the perfect sign for your needs. We have relationships with many sign manufacturers and installers that can make sure our designs are produced just the way you want them. Set yourself apart with quality signage... take a look at the construction sign to the right... Custom wrought iron and color digital print on aluminum substrate. Whether you need a small sign for your office, a large sign for the exterior of your building or even display graphics and signage for a trade show or event... we can help bring your brand and your ideas to life. 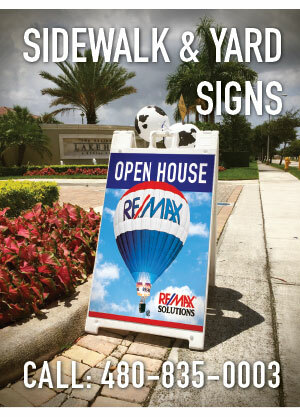 We also specialize in portable signs for temporary displays and sales presentations. And what will you give to your customers at your next event? We also offer a variety of promotional items such as pens, water bottles, hats, etc., that you can customer order with your logo and contact information on them.